Just hours before the first World Cup match kicked off in Brazil, Emirates, an Official FIFA Worldwide Partner, unveiled the first Boeing 777-300ER to feature the distinguishable signature of Emirates’ Global Ambassador and three times World Cup winner, Pelé. 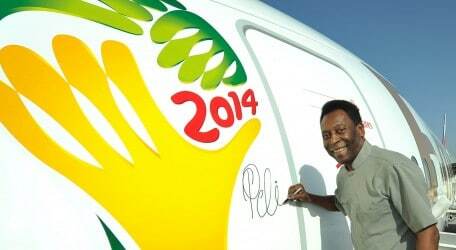 The Emirates Pelé-ane is connecting football fans with the action this summer on the Dubai to São Paulo route. Identifiable from the ground or the air, the 350 seater aircraft now has a creative design, specific to the FIFA World Cup™, emblazoned on the fuselage along with the recognisable signature of the legendary Brazilian football great. Two further Boeing 777 Pelé-ane’s were unveiled on the day of the opening match and one Airbus A380 was launched shortly afterwards. 115 Boeing 777 from the Emirates fleet, are flying football fans to Brazil, are also carring a large 2014 FIFA World Cup™ logo. At the airport: The World Cup buzz begins at the airport, especially at the airline’s hub in Dubai, where check-in desks now prominently feature the hero image from the Emirates #AllTimeGreats commercial featuring Pele and Cristiano Ronaldo. In the award-winning lounges both in Dubai and the many other locations around the world, passengers can relax with a bite to eat in front of the live streamed games. ice TV Live on 16 Emirates Boeing 777 aircraft: From 12th June to 13th July, passengers on board one of these 16 Emirates aircraft can watch all 64 matches ‘as live’ on the Sport 24 channel. If the flight doesn’t have ice TV Live: Passengers can still get goal-by-goal text updates on the ice Airshow moving map channels. On ice Digital Widescreen, the scores are shown in the news headlines under a dedicated FIFA Update section. Fun for young fliers: To keep the children on board entertained, Emirates is providing colourful snack boxes with cardboard cut-outs and stylish wrist bands in support of participating teams. The Emirates World Cup initiatives are on flights for the duration of the tournament starting from 11 June. The airline expects to fly over 18,000 passengers on its daily flights to Rio de Janeiro and São Paulo over the 2014 FIFA World Cup™ period.